Coronary computed tomography angiography (CTA) is increasingly applied for diagnosing coronary artery disease (CAD) in patients with chronic chest pain. Coronary CTA is a fast noninvasive test, which besides the detection of obstructive stenosis has the unique capability to identify also non-obstructive stenosis. Stable angina is typically characterized by episodes of myocardial ischemia due to a mismatch between oxygen demand and supply. The main causes of myocardial ischemia, which can be discerned, are CAD, microvascular disease, vasospasm, ischemic cardiomyopathy, and coronary anomaly. Beyond the identification of CAD, CTA enables myocardial perfusion imaging thus the detection of ischemic areas; furthermore by using prospectively ECG-triggered dual-step pulsing or retrospective gating, it allows to assess wall motion abnormalities. Recently two large randomized controlled trials, PROMISE and SCOT-HEART, reignited the discussion on the use of coronary CTA. 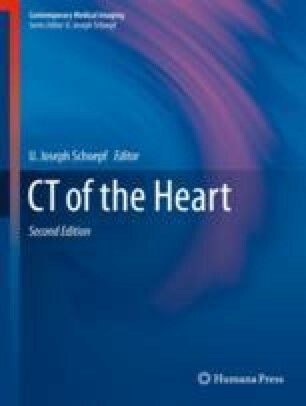 In this chapter the role of coronary CTA for diagnosing, prognostication, and treatment will be discussed for patients with chronic chest pain. Kang EJ, Kim MH, De Jin C, et al. Noninvasive detection of coronary vasospastic angina using a double-acquisition coronary CT angiography protocol in the presence and absence of an intravenous nitrate: a pilot study. Eur Radiol. 2016. https://doi.org/10.1007/s00330-016-4476-2.